A publication produced by the Division of Forestry, Minnesota Department of Natural Resources. Smaller acreages (1-20) present challenges to effective sustainable management of these lands, including natural preservation, restoration, fire control, pest control, as well as conservation management. 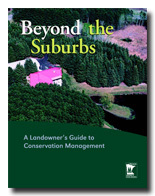 The purpose of this guidebook is to give you—the private landholders of Minnesota—a tool for a better understanding of conservation management. Why is it Published? Who is it For? Inspire you as a landowner to apply conservation practices to your land. There are many things you can do with your property! This guidebook is written to help you accomplish your goals without the undesirable effects that could result from decisions made without basic conservation management principles in mind. Create a greater understanding of conservation practices and increase your knowledge of resources available to assist in conservation management activities.